Water is part of the everyday world of every single person. The outstanding importance of water for life on earth is demonstrated to students particularly effectively by examining the physical and chemical properties of this substance. The physical properties of water are dealt with in both physics and chemistry teaching at grade 8 and 9. In physics teaching a focal point is on the thermodynamic properties of water. Chemistry teaching deals predominantly with the atomic structure of water molecules and the resulting chemical properties. The molecular structure in particular provides an explanation of the in some respects anomalous physical properties of water, for which reason the topic is ideally suited for cross-curricular teaching. 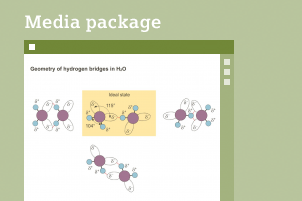 The media package provides several media files (charts, simulations, experimentation instructions, information sheets, a worksheet and a guideline for teachers) to support you in this real-world-oriented teaching!